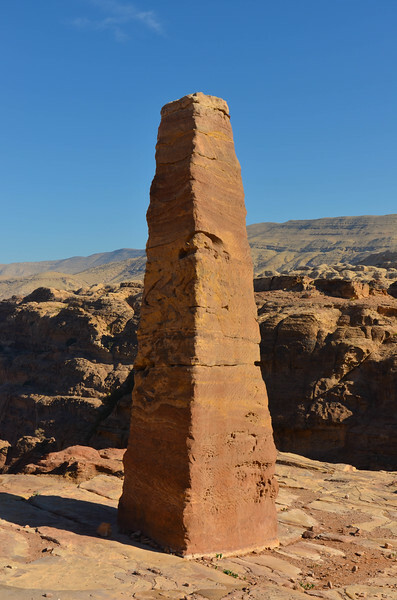 One of the Two Obelisks. 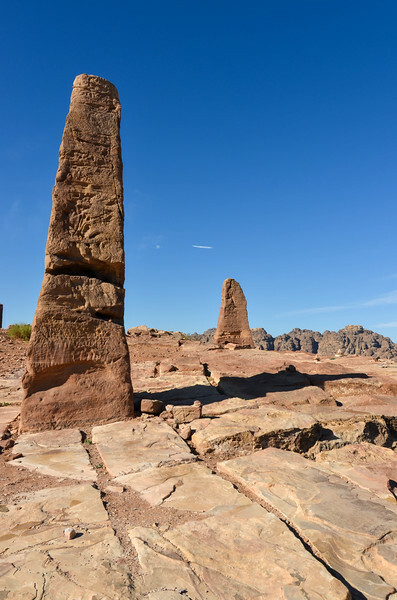 The Two Obelisks. 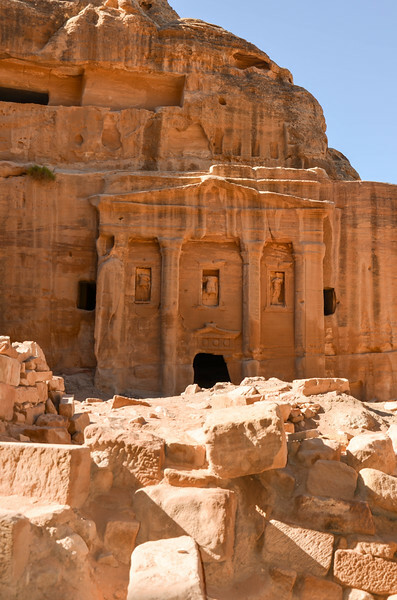 These were not built; instead, the Nabateans carved the mountain out around them, leaving the obelisks behind. Looking out the entrance of the Garden Tomb. Looking out of the Garden Tomb. 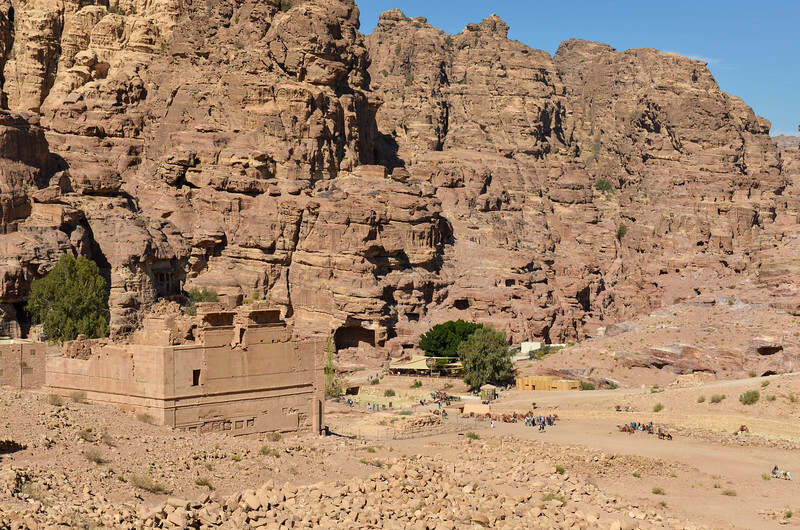 Looking down on the Roman Soldier Tomb from the Wadi Farasa trail. 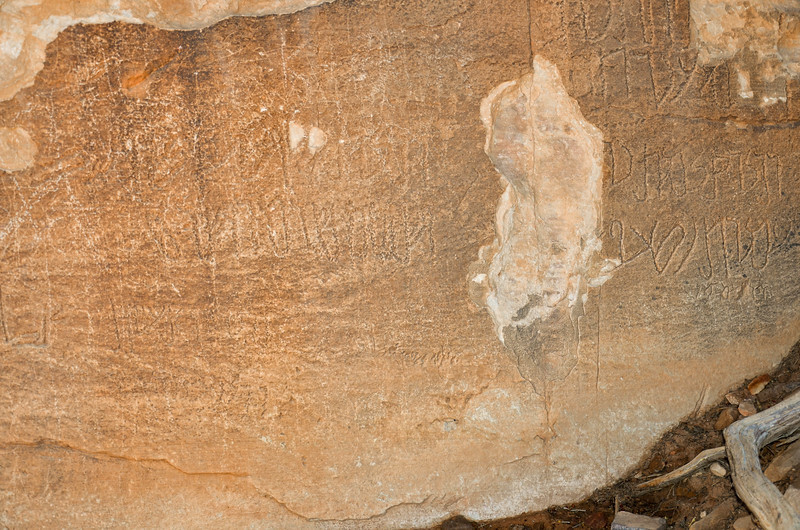 Nabataean inscriptions on a rock along the Wadi Farasa trail. 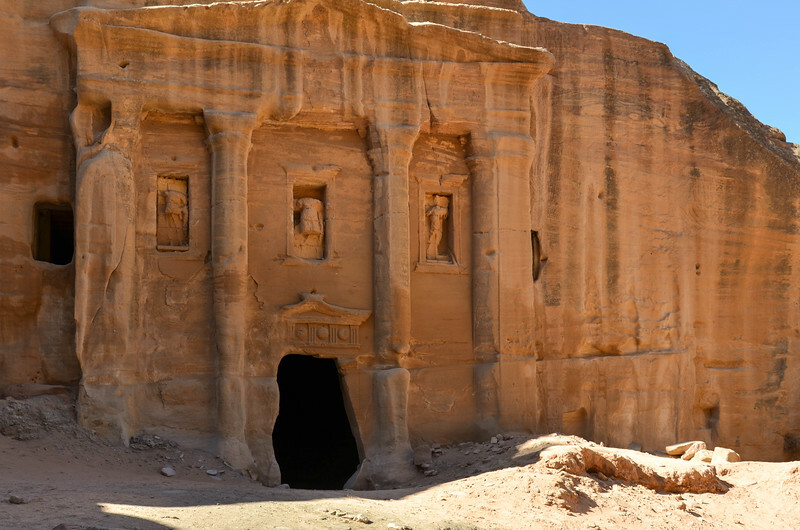 A hidden tomb under a cliff on the Wadi Farasa trail. 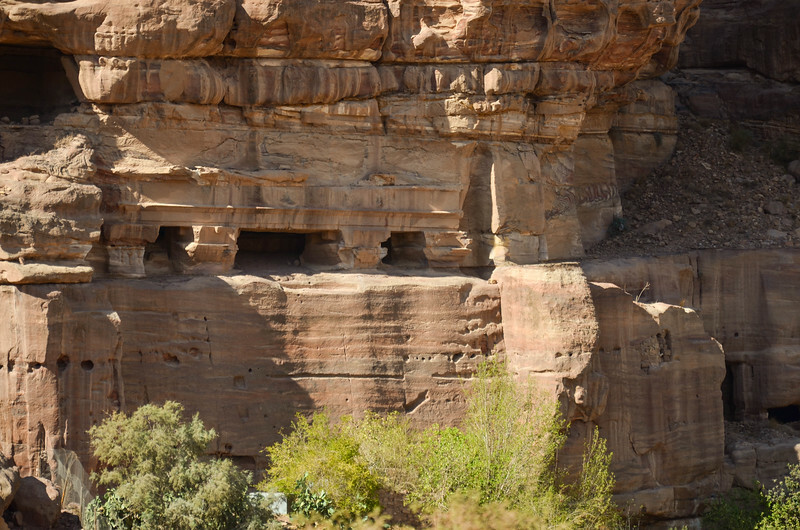 Tomb hidden under a cliff on the Wadi Farasa trail. 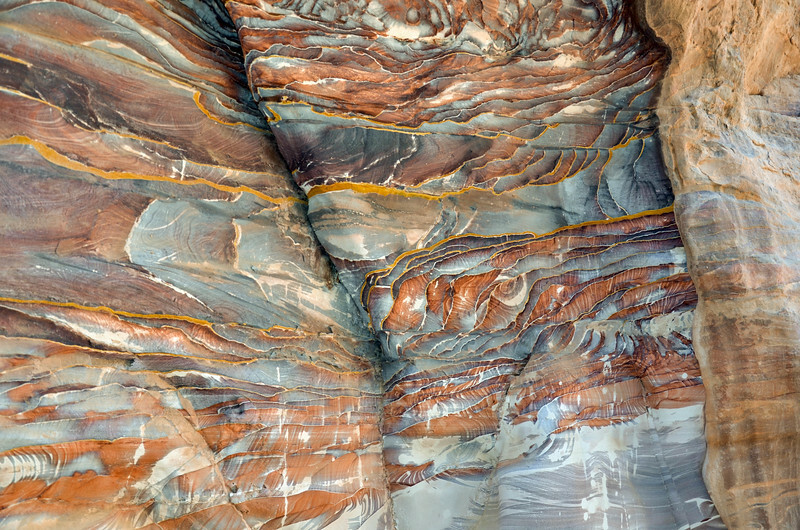 Rock cut on the Wadi Farasa trail. 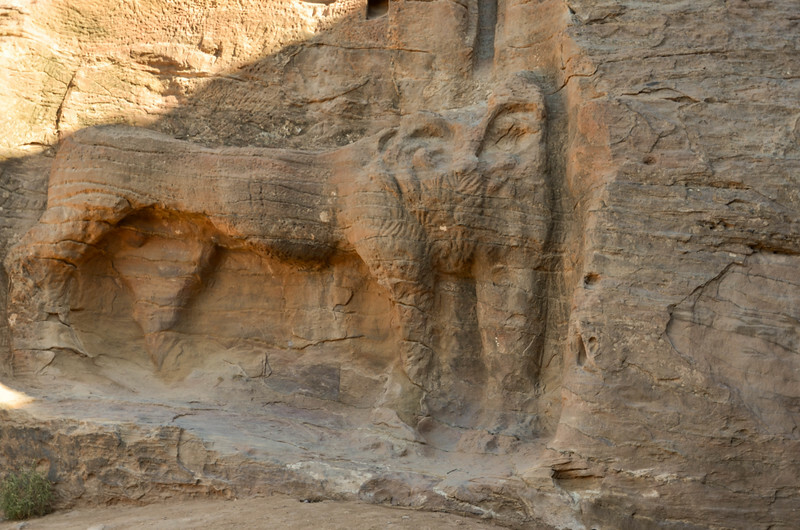 The Lion Monument on the Wadi Farasa trail. This is thought to have originally been a fountain. 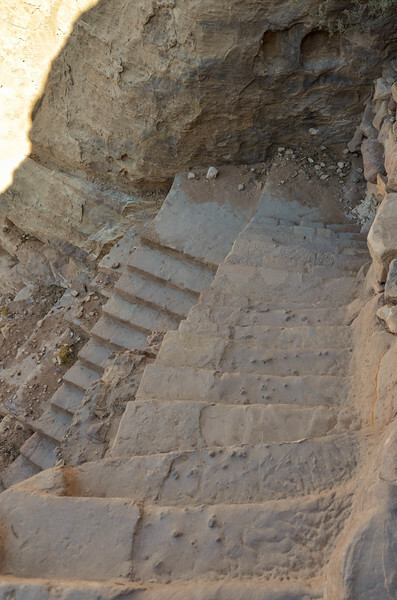 Steep stairs lead down from the Lion Monument on the Wadi Farasa trail. 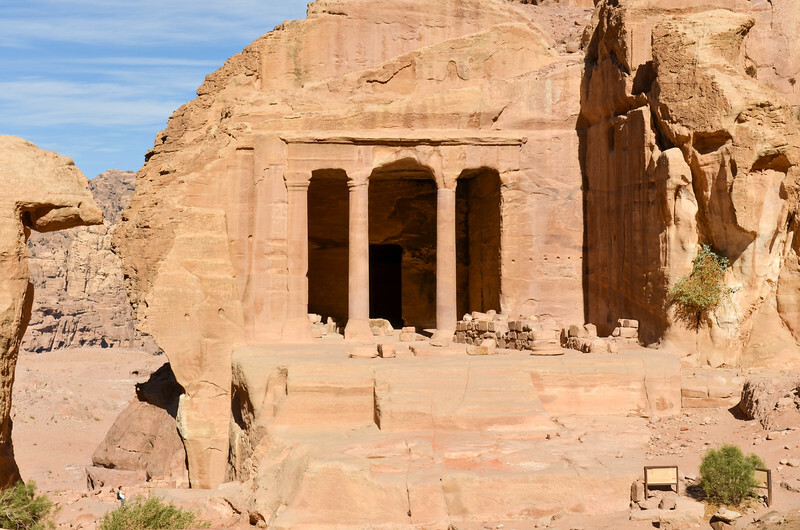 The Garden Tomb at Wadi Farasa. 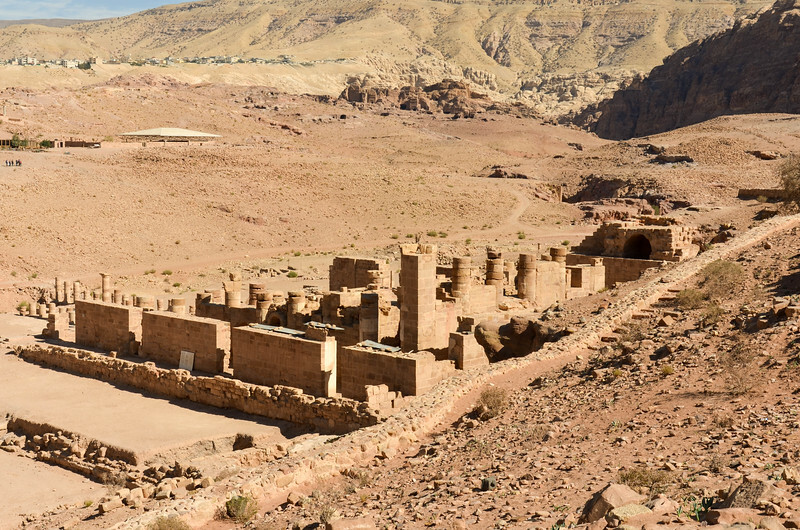 Ruins of the colonaded street between the Roman Soldier Tomb and Garden Triclinium. The interior of the Garden Triclinium. 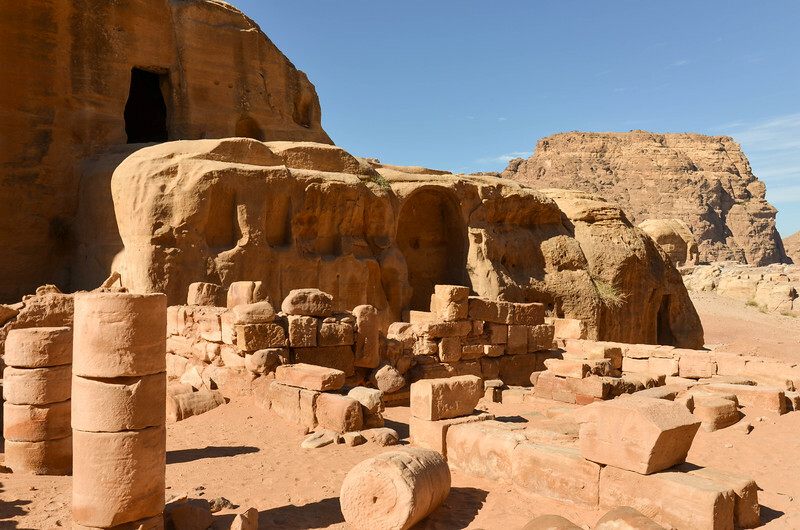 The exterior of the Roman Soldier Tomb. 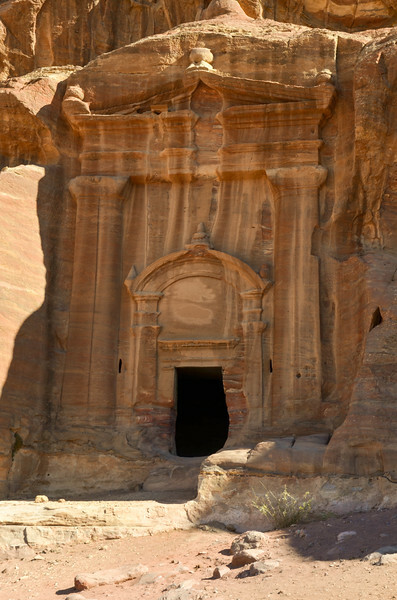 The Renaissance Tomb, named because of its architectural style. 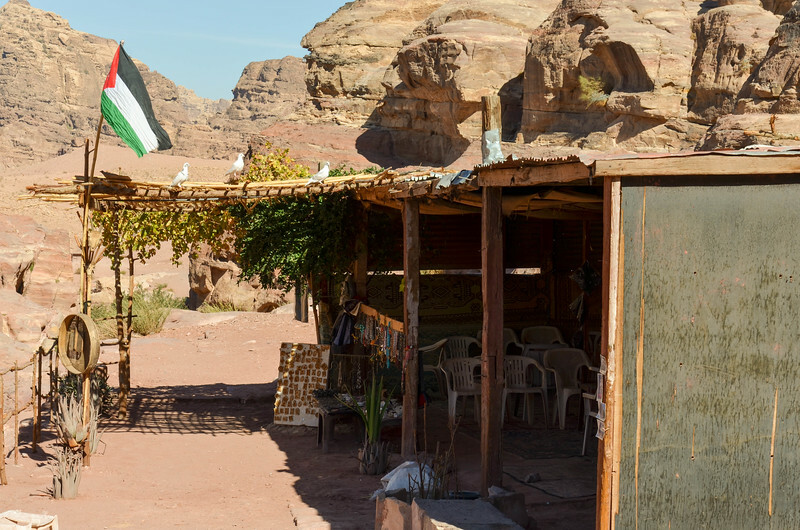 A small Bedouin café along the Wadi Farasa trail. 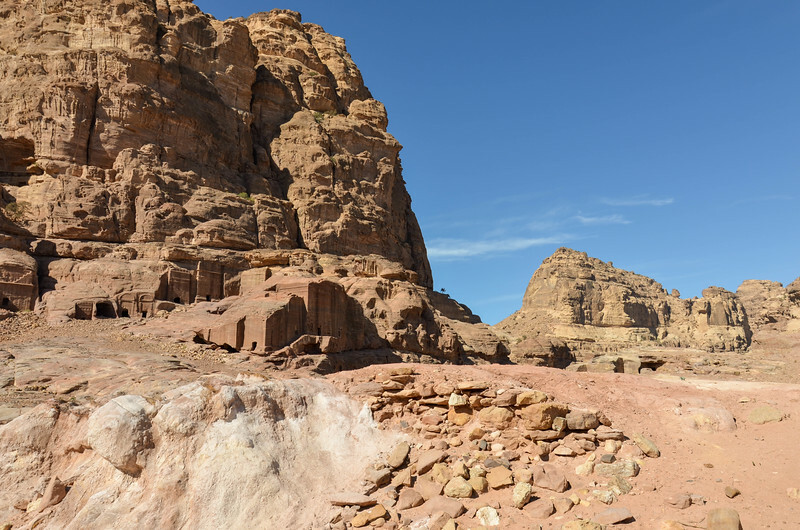 The Wadi Farasa Trail heads across the desert, back toward the center of Petra. 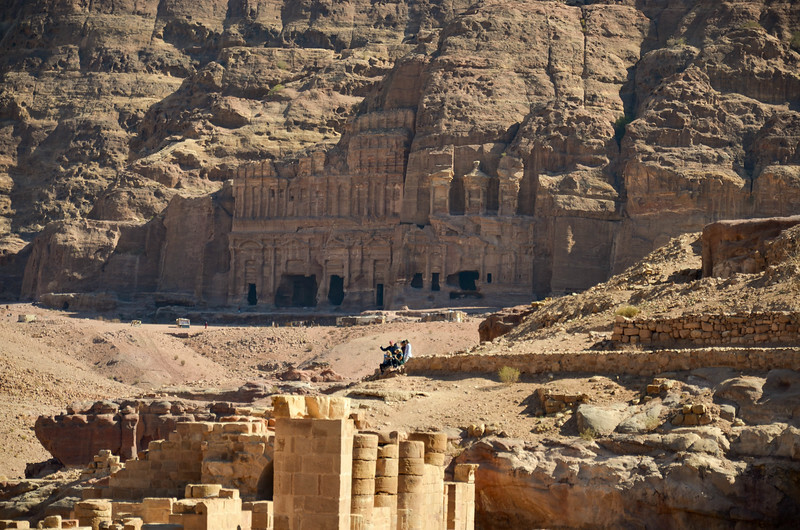 In reality, we were still an hour's hike from the center of the ancient city. 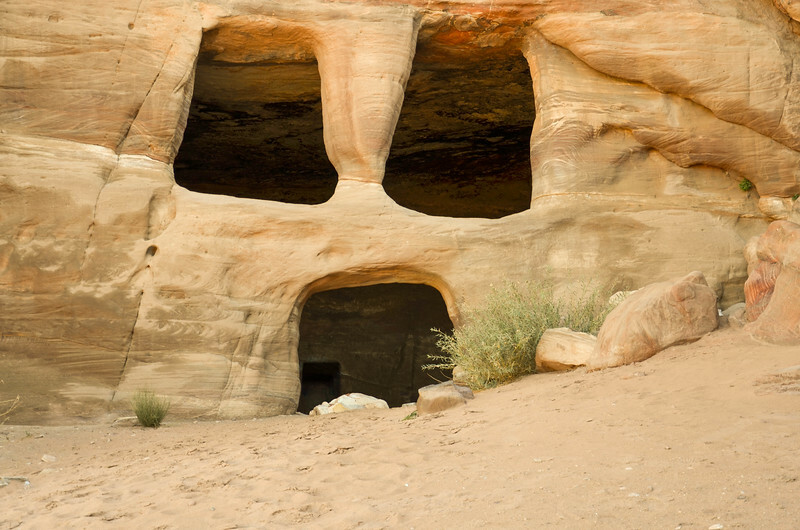 I thought this cave looked like a face. 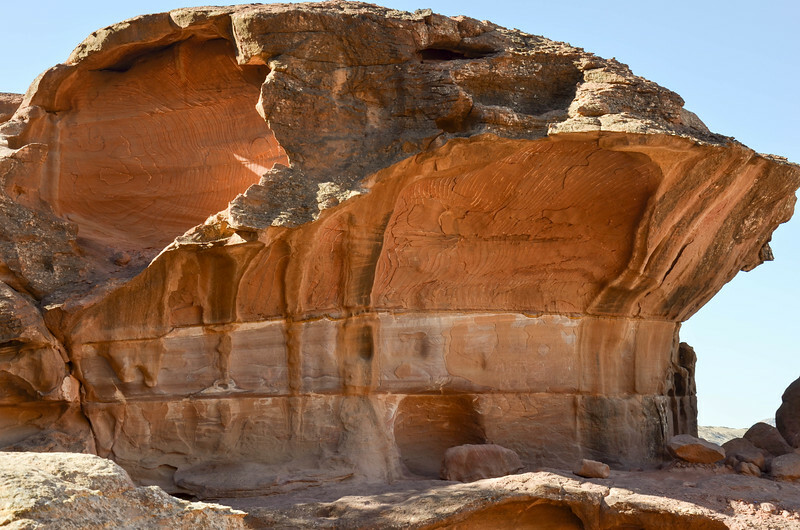 Numerous tombs exist along this portion of the Wadi Farasa Trail. 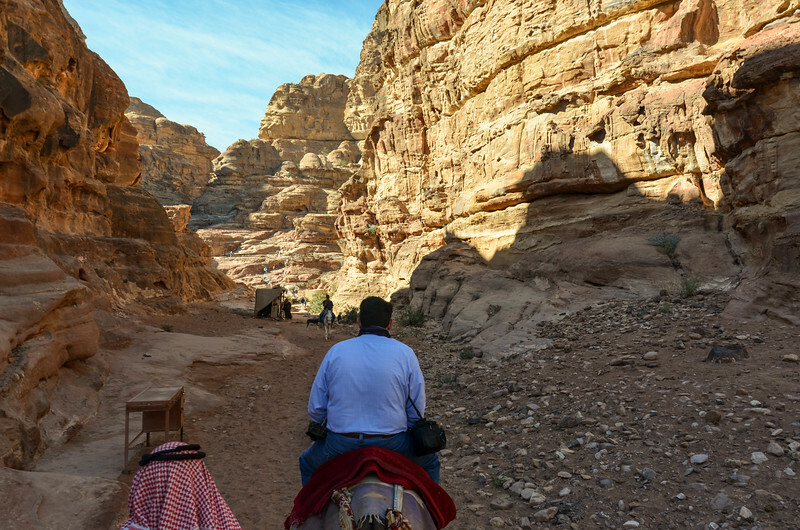 These Bedouin children came up to us on the Wadi Farasa trail asking for biscuits. 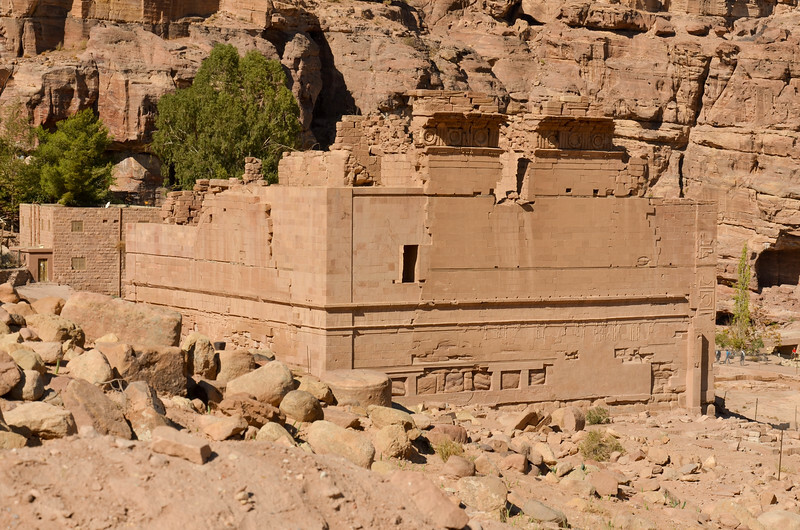 More tombs carved into the mountains along the back portion of the Wadi Farasa Trail. 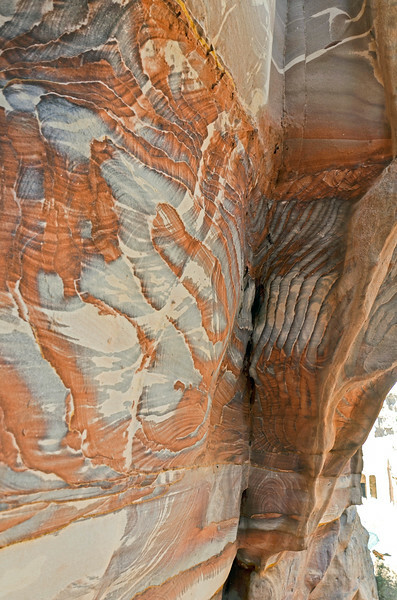 There were countless caves carved into the mountains here. 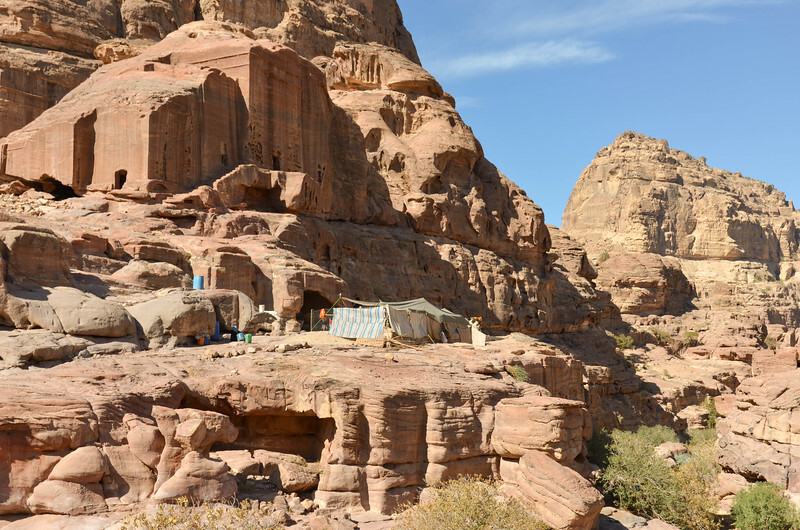 A Bedouin camp among the caves. 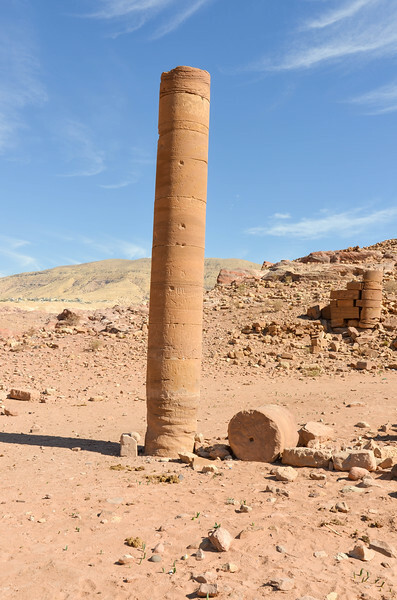 Pharaoh's Column. 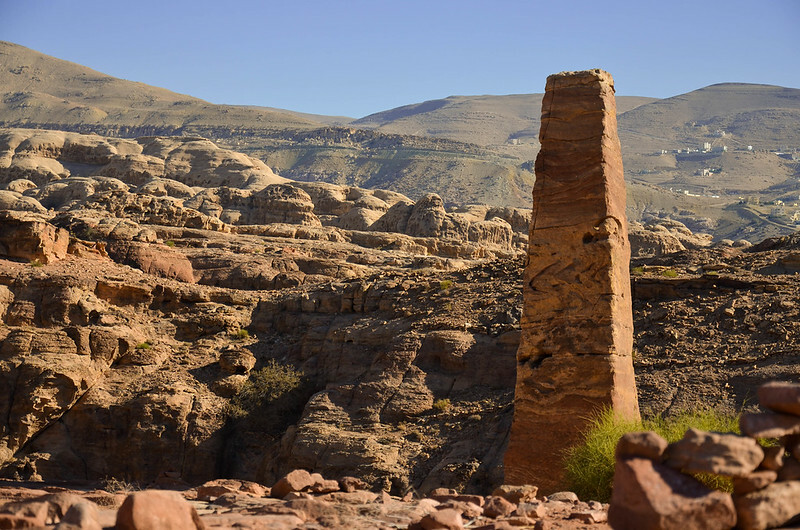 This lone column serves as a waypoint for travelers along the end portion of the Wadi Farasa Trail. 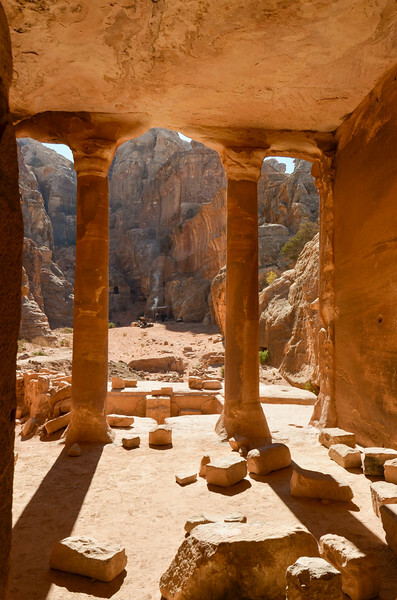 The trail is mostly unmarked in this area, and requires some study of the map and compass to figure out how to get back to the center of Petra. 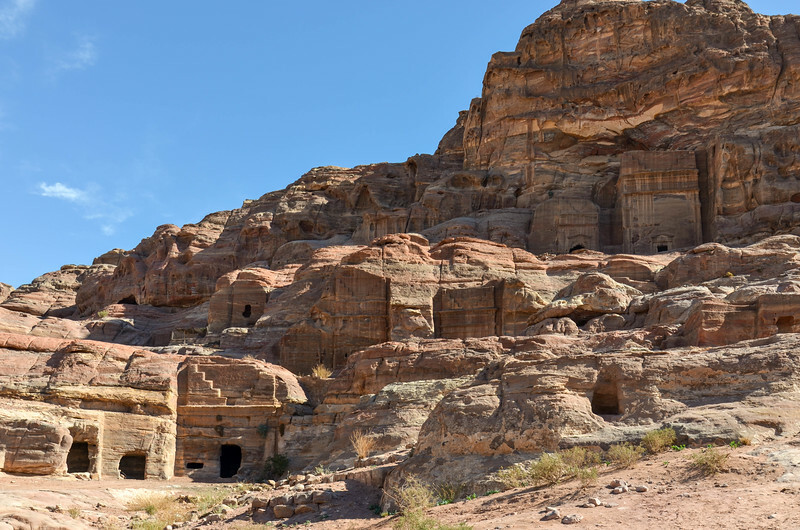 Finally, we make it back into the center of Petra. 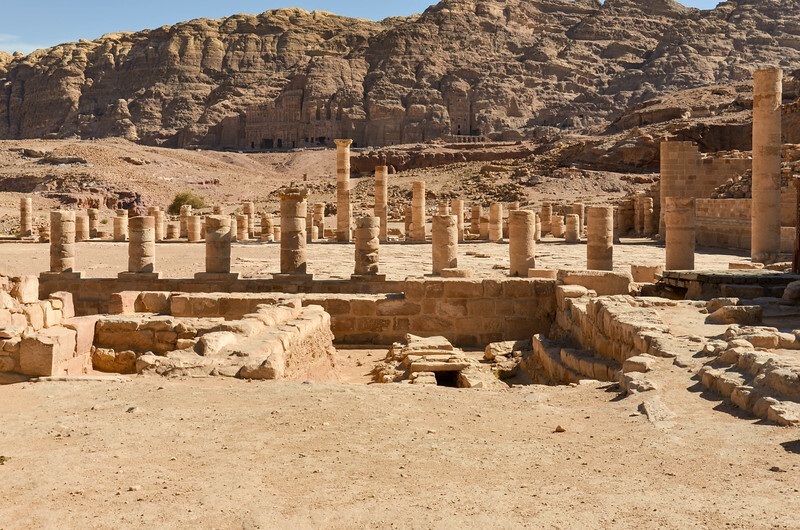 These are some of the newer ruins in the city, dating from the Roman period. 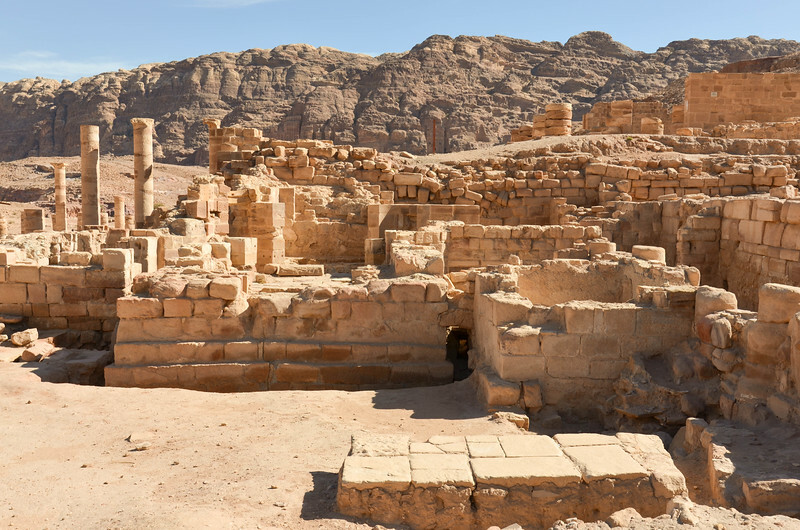 The central area of Petra, with the Qasr al-Bint, the only major freestanding Nabataean structure that remains in Petra. 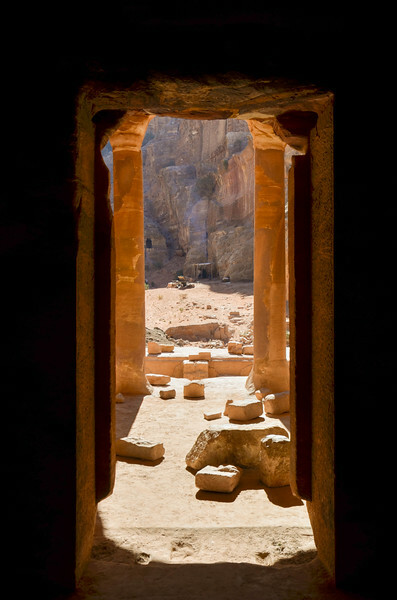 Looking out across the Roman ruins to the Royal Tombs in the distance. 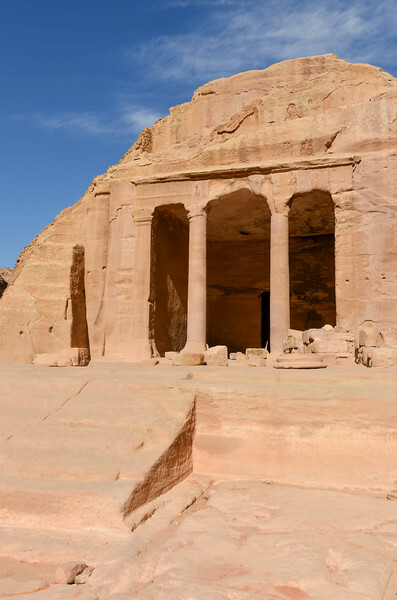 The Qasr al-Bint, the only remaining freestanding Nabataean structure. 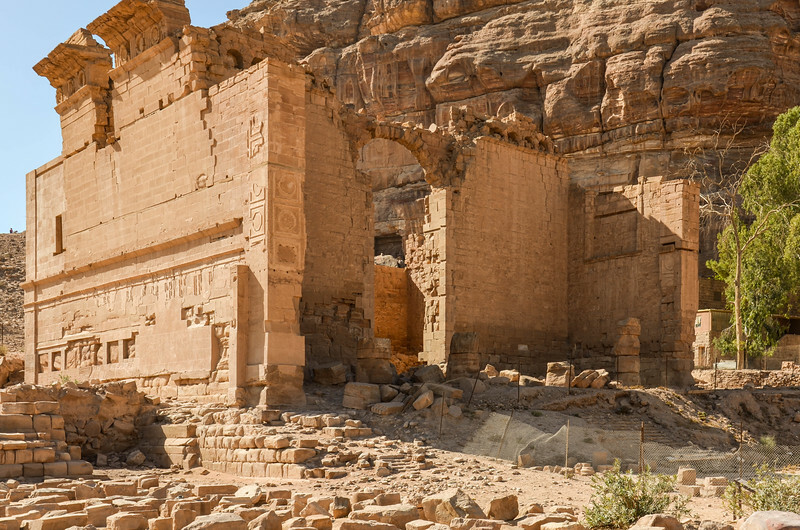 Petra's Roman ruins. 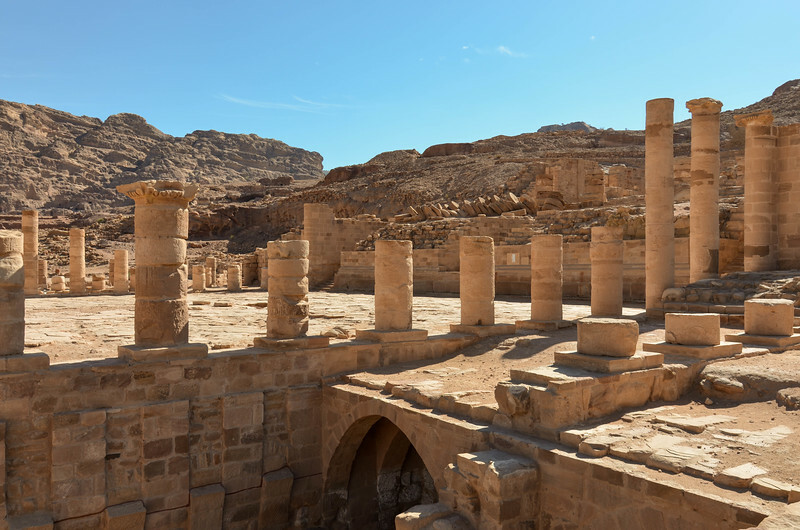 The columns are part of the Great Temple. 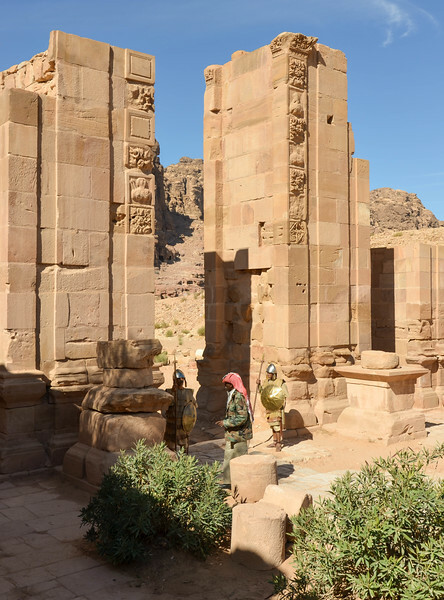 The Temenos Gate, along the Colonnaded Street, complete with a Bedouin man and two people costumed as soldiers. 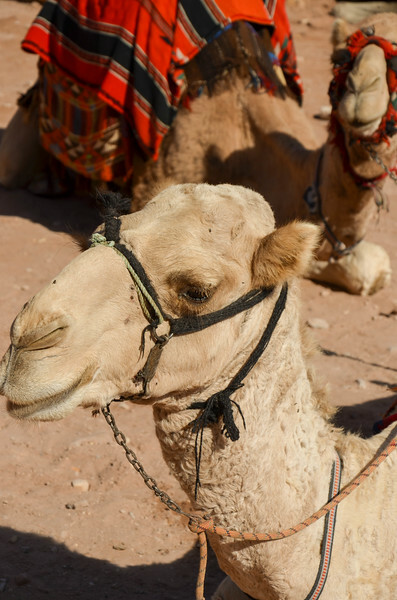 Camels wait to carry tourists back to the Treasury. 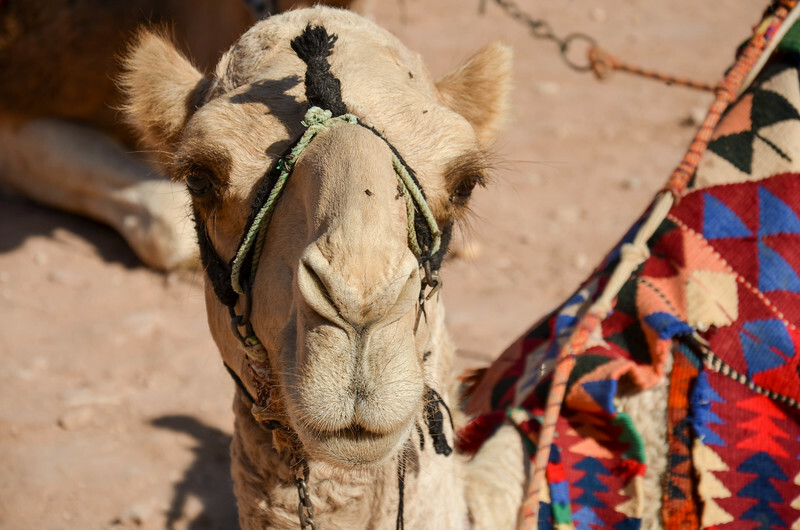 One of the camels in Petra. 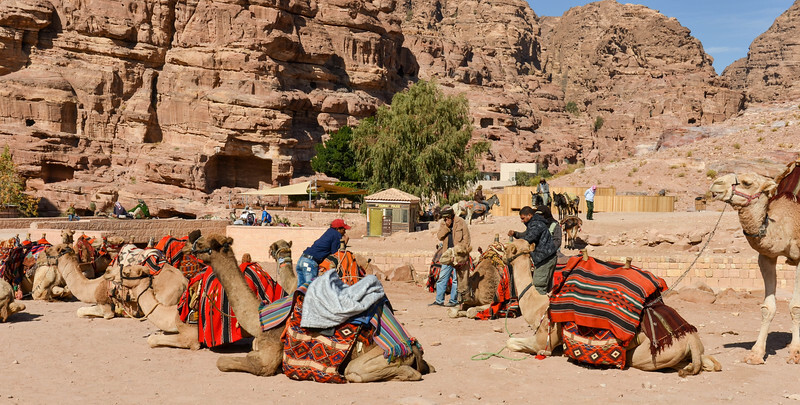 Some of the camels in Petra. 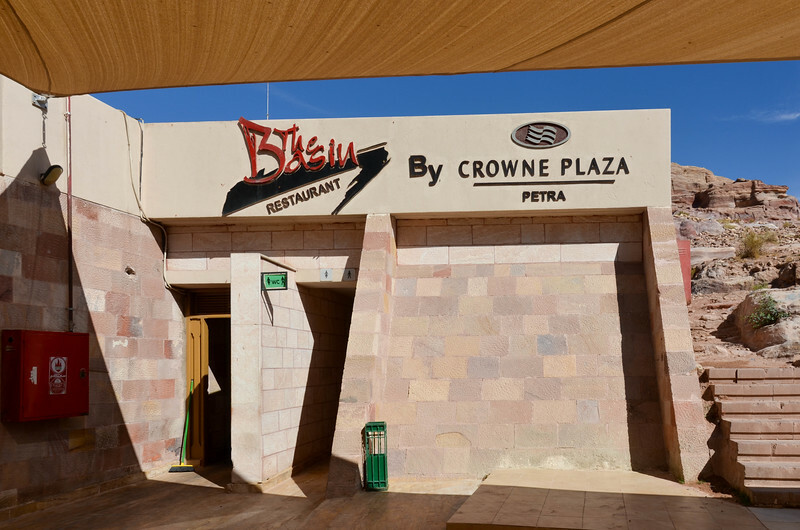 The Basin Restaurant, operated by the Crown Plaza resort in Petra. 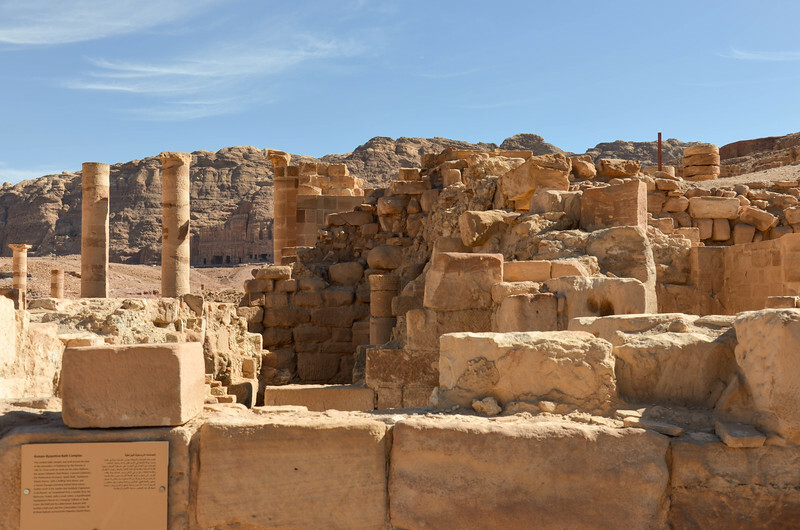 This is one of two full-service restaurants located in Petra's central area. 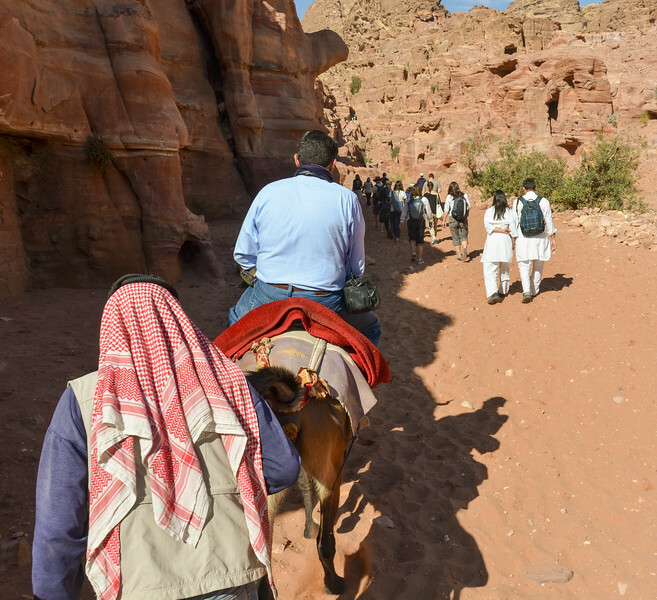 We start up the trail to the Monastery (Ad-Deir), with Brian and his mule taking the lead, and our guide, Friday, in the middle. 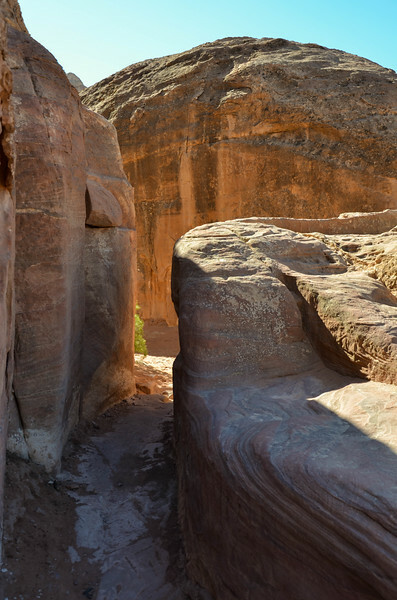 This was the easy part of the trail to the Monastery. 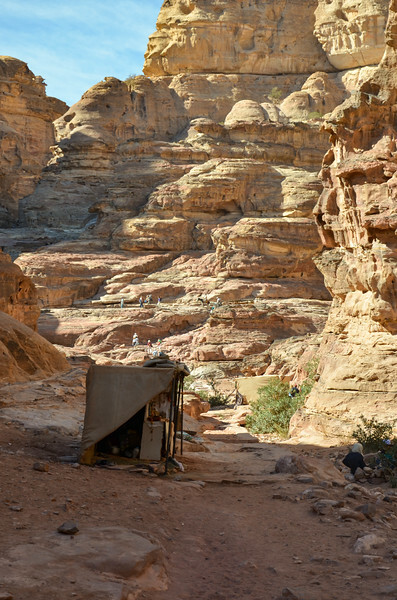 One of the many Bedouin tent shops along the trail to the Monastery. This was just before the trail started to get steep. Brian and his mule start up some of the worst of the steps.